…Evolutionists, even doctors of biology, believe the mutation nonsense, but they have a hissy fit at the thought that nuclear radiation could possibly cause a mutation. They start nutty, false rumours that three-eyed frogs are being found near a nuclear power plant. If the mutation theory were true they should be overjoyed at the thought that nuclear radiation could possibly create a three-eyed frog by mutation. They should go around radiating everything in sight in order to speed up the evolution of a new species. Evolutionists should irradiate themselves. Perhaps they would grow a brain by mutation. From this claim, Bible Life Ministries has shown its blatant ignorance and their apparent liking for insults. Typical creationist mindset. Anyway, let’s see why DNA repair can be a product of evolution as well. DNA repair is a set of mechanisms in which our cells identify and correct damages made to our genes. Everyday, environmental factors cause great damage upon our DNA, mainly through ionised radiation (including ultraviolet rays, beta/gamma rays. There is little evidence that hand phone radiation harms us, though. ), and also through normal metabolic activities. This relentless assault from so many factors creates an average of 1 million molecular lesions per day. Accumulated, these damages cause cancer, diseases and aging. Despite that, we still survive into 70s on average, and that’s to thank our body’s DNA repair mechanisms. Direct reversal of lesion is obviously the simplest way to repair it, but is rarely possible, as most lesions are irreversible. However, in some cases, it works. On of these cases would be the formation of thymine dimers (a common type of cyclobutyl dimer) upon irradiation with UV light. 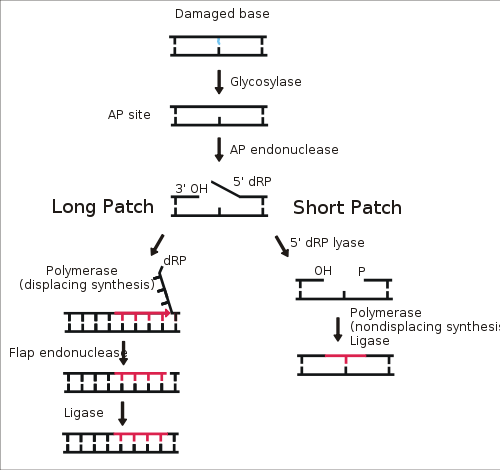 Through the photoreactivation process, the enzyme DNA photolyase repairs the DNA lesion. Photoreactivation is present in most bacteria and also in quite a few eukaryotes, including some vertebrates, but is absent in humans and other placental mammals. 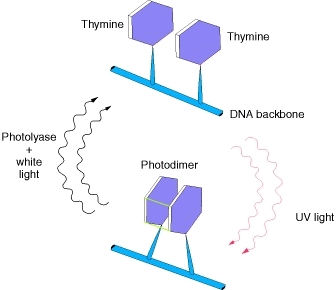 Repair of a UV-induced pyrimidine photodimer by a photoreactivating enzyme, or photolyase. The enzyme recognizes the photodimer (here, a thymine dimer) and binds to it. When light (wavelength between 300 and 500 nm) is present, the photolyase uses its energy to split the dimer into the original monomers. (After J. D. Watson, Molecular Biology of the Gene, 3d ed. Copyright © 1976 by W. A. Benjamin). Alkylating agents are also one group of chemicals that can lead to DNA damage. These agents are quite common in the environment, are used as anticancer compounds in the clinical setting, and exist inside cells. Such agents can cause damage to the DNA backbone. These are a the proteins that is responsible for the repairing of such damages: the N-terminal domain of the E. coli Ada protein, the O6-alkylguanine-DNA alkyltransferase family, and the AlkB family. Repair of a nick by DNA ligase. 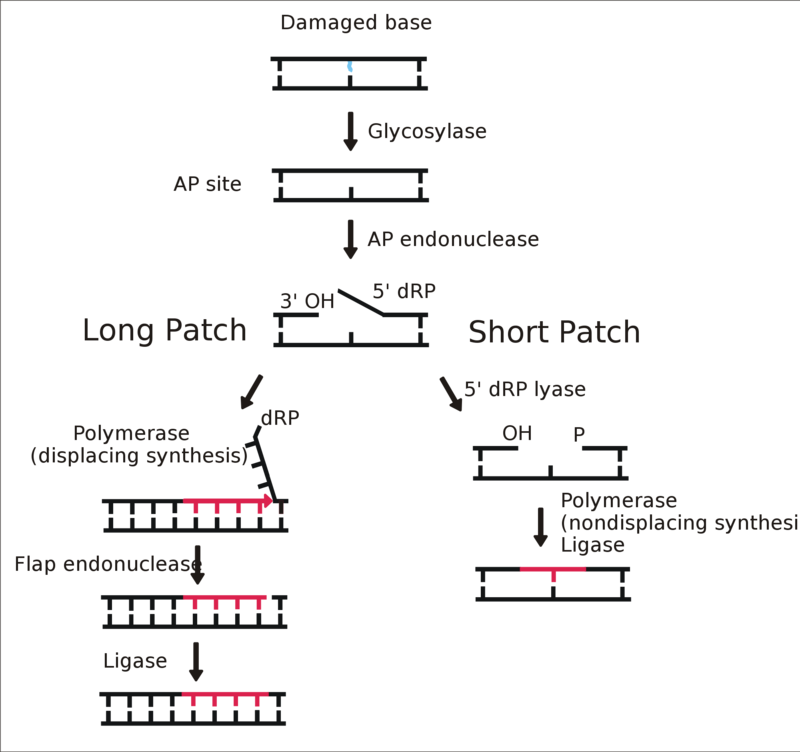 The single base lesion is the most common form of DNA damage occurring in the human genome. A DNA base can be lost through spontaneous hydrolysis, oxidized and/or alkylated during physiologic metabolism and can be modified by exogenous DNA damaging agents. Base excision repair is the pathway most commonly used to repair small, non-helix distorting base lesions, such as incorrect bases (like uracil) or damaged bases (like 3-methyladenine)from the genome. Base Excision Repair in Action. Nucleotide excision repair is an versatile repair pathway that is capable of able to deal with more extreme forms of damage such as intra-strand crosslinks and bases that have become modified by attachment of large chemical groups. It is also able to correct cyclobutyl dimers by a dark repair process, providing those organisms that do not have the photoreactivation system (such as humans) with a means of repairing this type of damage. DNA mismatch repair is a highly conserved pathway in which our cells repair base-base mismatches and insertion/deletion mispairs generated during DNA replication and recombination. 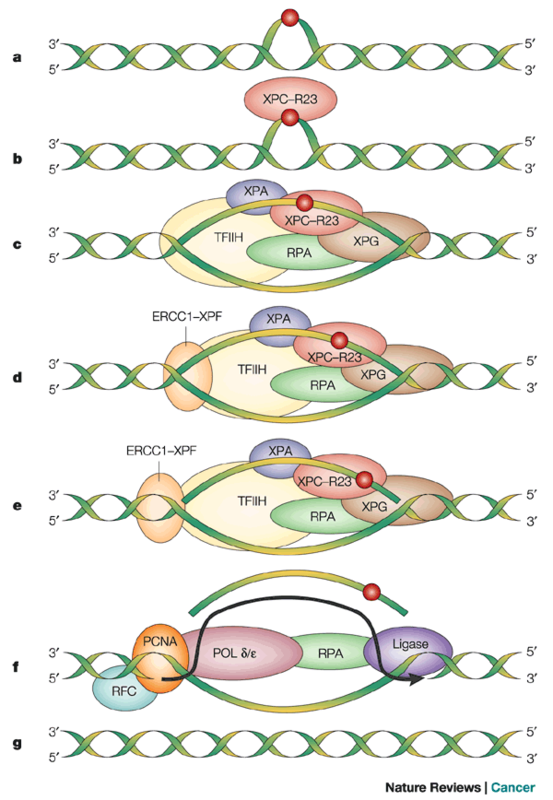 Mismatch repair systems maintain the integrity of our genomes by suppressing non-homologous recombination and was recently shown to play a role in DNA damage signalling in eukaryotic cells. Defects in MMR increase the spontaneous mutation rate, and have been associated both hereditary and sporadic cancers. 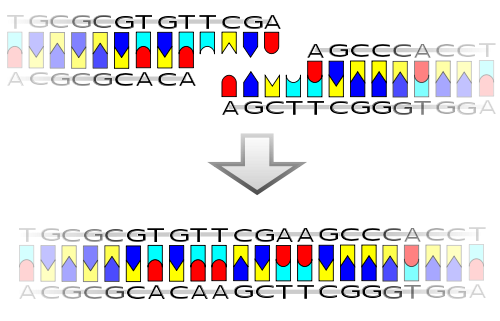 The proteins unique to MMR were first identified in prokaryotes, in which the loss of such proteins resulted in increased mutations and a mutated phenotype. These proteins are known as the “Mut” proteins. Of all the “Mut” proteins, MutS, MutL, MutH are essential in detecting the mismatch and directing repair machinery to it. The first step in the MMR system involves efficient recognition of helical distortions (mismatches) resulting from nucleotide misincorporation or DNA polymerase slippage. After that, the newly synthesized DNA strand containing the incorrect information must be selectively removed and re-synthesized. Strand discrimination is an essential feature of all MMR systems; in its absence, a replication error is just as likely to be used as a template for repair as it is to be repaired. Whereas the latter steps in MMR require proteins involved in general DNA metabolic processes, the initial mismatch recognition and removal steps require specialized Mut proteins, which are highly conserved evolutionarily. There are 3 methods to repair double-strand breaks. These are: homologous recombination (HR), non-homologous end joining (NHEJ), and microhomology-mediated end joining (MMEJ). At first glance, such a system may look too complex too have evolved. However, there is a simpler explanation for DNA repair than to invoke a designer. Its called evolution through natural selection. As any system that has an repairing system, no matter how primitive, gives the phenotype a much greater survival advantage, and over the years, continued improvement of the DNA repairing system evolved it to the complex system it is today. The creationist seems to miss the point that the first DNA repair system need not be as effective nor as complex before. Secondly, the DNA repair system is far from perfect. In fact, this system is unable to handle all types of molecular, and repair damages much slower than the occurring of lesions themselves. In fact, this is the cause of aging and the obvious increase in diseases as we grow older. Sometimes, the repair systems even cause greater damage than the lesions it’s supposed to repair. Surely an omniscient designer wouldn’t create such a error-prone repair system? However, the creationist may say that this systems fits the Bible/Quran better, as our body is constantly going downhill, just as stated in their “holy text” and the Second Law of Thermodynamics. This claim however, isn’t true at all, and I shall show in my next post that evolution fits nicely with the Second Law of Thermodynamics. Yukiko Mishina, Erica M. Duguid, and Chuan He. (2006) Direct Reversal of DNA Alkylation Damage. Chem Rev. 2006 February ; 106(2): 215–232. In the Executive Office of the President, the main body advising the president on science policy is the Office of Science and Technology Policy. Other advisory bodies exist within the Executive Office of the President, including the President's Council of Advisors on Science and Technology and the National Science and Technology Council. Further advice (on legislating science policy) is provided by extra-governmental organizations such as The National Academies, which was created and mostly funded by the federal government, and the RAND Corporation, as well as other non-profit organizations such as the American Association for the Advancement of Science and the American Chemical Society among others. LOL. evolution was not even a possible mechanism when the repair enzymes got in place. They had to exist prior of life to exist, and prior to replication.